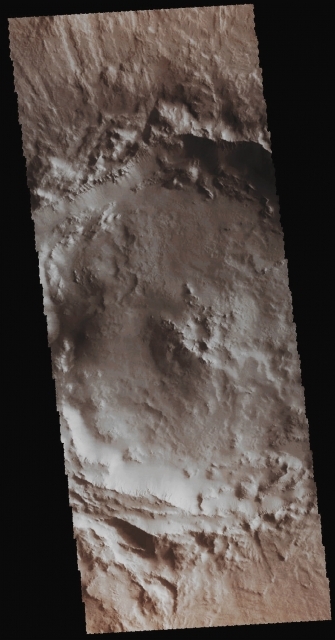 In this very nice an intriguing VIS image, taken by the NASA - Mars Odyssey Orbiter on December, 28th, 2015, and during its 62.280th orbit around the Red Planet, we can see an ancient (REALLY ancient!) Unnamed Impact Crater - located in the Martian Region known as Amazonis Planitia - which has a truly Complex Rim. As a matter of fact, at the bottom of the frame we can see that this Unnamed Impact Crater shows several Parallel Rims while, on the other side, the Rim at the top of the picture is (kind of) Lobate, but not quite Round. Such complexities may indicate that the Surface where this impact occurred was - perhaps, but we have no way to be sure about it - not homogeneous. This image (which is an Original Mars Odyssey Orbiter b/w and Map Projected frame published on the NASA - Planetary Photojournal with the ID n. PIA 20416) has been additionally processed, magnified to aid the visibility of the details, extra-contrast enhanced and sharpened, Gamma corrected and then colorized in Absolute Natural Colors (such as the colors that a normal human eye would actually perceive if someone were onboard the NASA - Mars Odyssey Orbiter and then looked down, towards the Surface of Mars), by using an original technique created - and, in time, dramatically improved - by the Lunar Explorer Italia Team.